With one of the best power/size ratios, VACON® NXP Liquid Cooled drives are ideal for applications where space is at a premium or air cooling is difficult. Heavy industries with harsh operating conditions, such as in marine, offshore and mining environments benefit from the drive’s compact design and robust reliability. Liquid-cooled AC drives can be used in many combinations, from a single dedicated frequency converter to large-scale common DC bus systems. Packed with features, these fully standardized drives maximize the utilization of space while minimizing overall lifecycle costs. 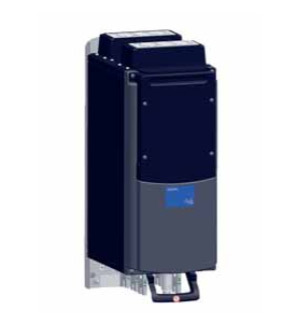 As a high degree of protection (IP54 or higher) can easily be achieved with these drives, they can be installed almost anywhere in a plant or on a vessel. This eliminates the load on air-conditioning systems in electrical rooms reducing costs and installation time, and makes them ideal for retrofitting. Servicing is fast and easy. Features such as safe torque off (STO) and safe stop 1 (SS1) improve safety, and conformal coated circuit boards enhance reliability. Compressors, wind turbines, extruders, pumps, fans, conveyors, crushers, thrusters, and propulsion, test-bench, crane, winch and power-conversion systems.